2a. The detail that stood out to me was the scale of the painting and the abstraction of the texts in the painting. 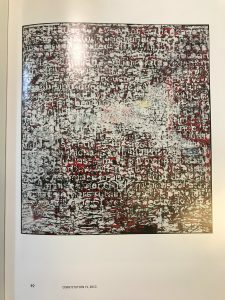 When I was standing closely to the painting, the texts looked very abstract and illegible. As I got closer to the painting, there were so many layers of paper that have been pasted and then taken off. The texture of the painting looked as if they were worn down because of natural attrition. 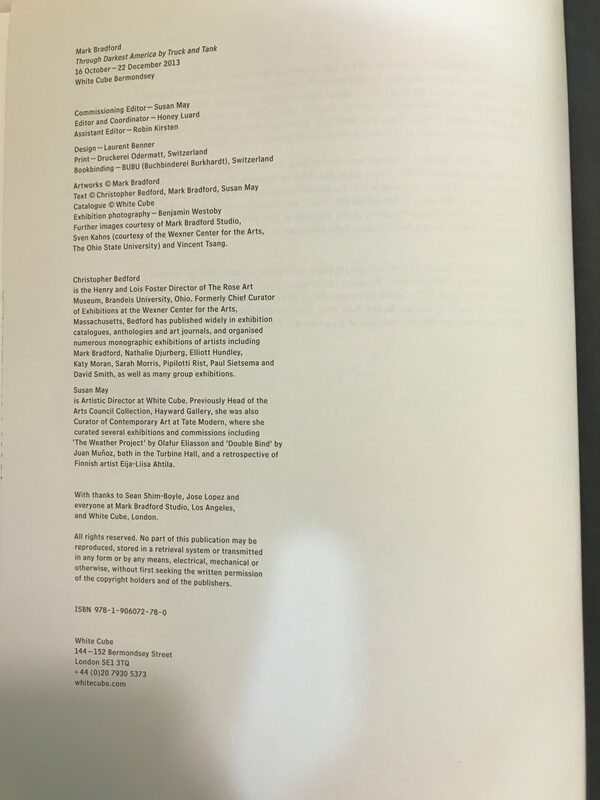 The texts looked like they were made by pasting the texts and then taking off the letters so that they create negative space of the texts. 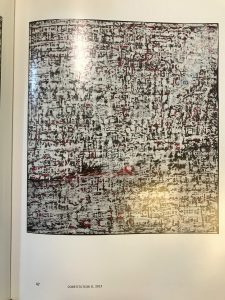 As I got further from the painting, the texts were more legible, but they were still impossible to understand and recognize each words. I assume that the artist deliberately used this scale to give this effect of going back and forth to the viewers. 2b. The artist used found and cut paper and acrylic on canvas. His repetition of pasting and erasing the paper supports his contents that the document is also a living one that can be subject to modification. 3a. The materials cohere together by layering and scraping them. 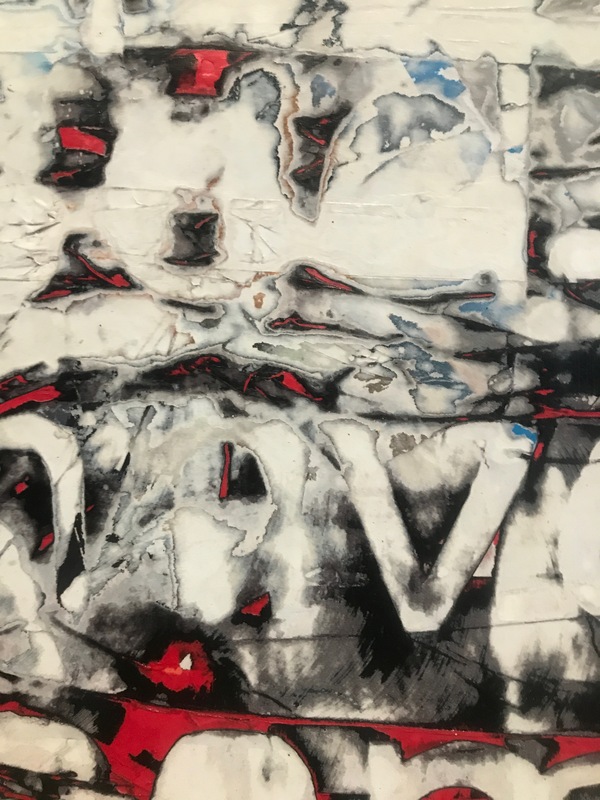 The colors the artist used are mostly red, white and black, but due to numerous worn down layers of paper, it is hard to recognize whether the colors used are paints or from the actual materials. 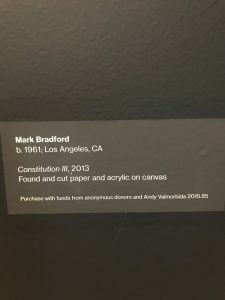 The text for this painting provides the information that the texts in this painting are from the U.S. constitution, but even after realizing that the texts are from the U.S. constitution, it is still impossible to understand the contents of the texts. The work relates to the other items in the exhibition by using the past as a contemporary reflection. 3b. 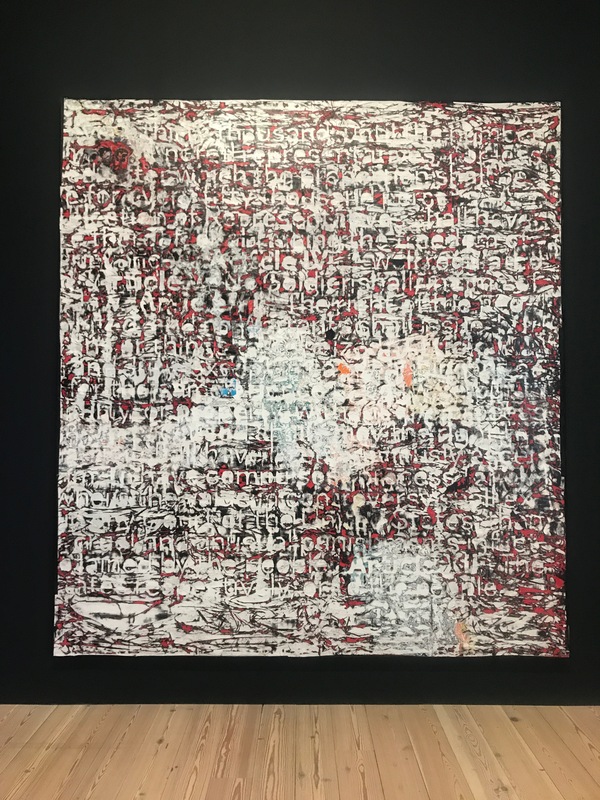 It is hard to know exactly when the materials are produced because the materials Mark Bradford use are the illegal posters that are found on the streets, but assuming from the fact that the painting is made in 2013, the materials he used are recently produced materials. 1. Why did he abstracted the texts? This question is relevant to my research issue because I am also using found materials for my final projects. 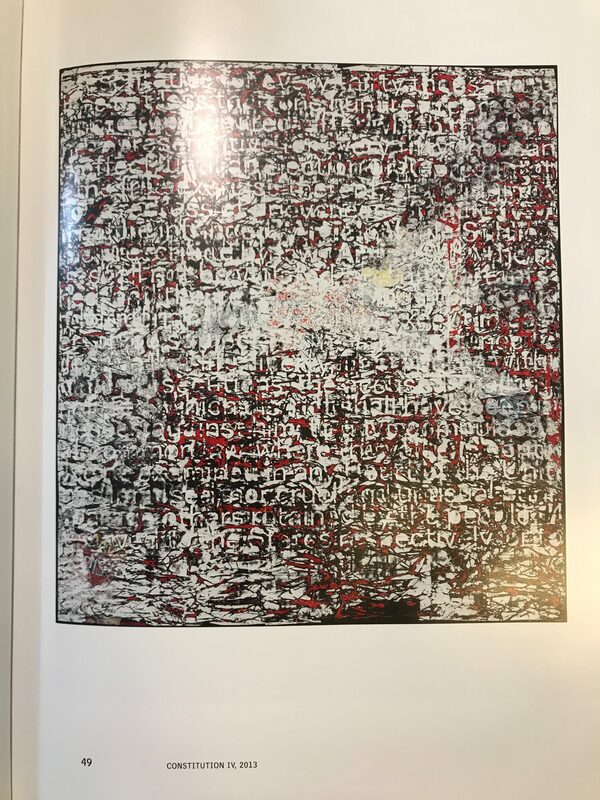 Mark Bradford collected the illegal posters from the streets in LA and he layered them and sanded them to make it abstract. Since some artists who use found objects in their works present the objects without changes or modifications while others use other media to change it, the reason he abstracted the texts and made them illegible is important factor in his painting. 2. Where did he collect this materials and why? Where he found this materials are important to my research because the original location of the found objects can change the context of the painting. Moreover, if he have a specific location that he collected from, the reason why he chose the location is important for interpreting this work. 3. How does his works comment on social issues in the United States? How he comments on social issues is important for understanding his work because his work is almost purely abstract and it is hard for the viewers to interpret this work as political attitude. 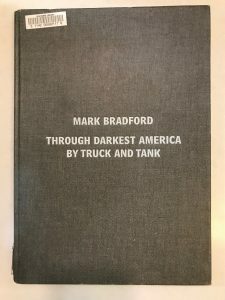 Also this is important because he is using past materials to comment on contemporary society and the connection between the two is crucial to understand his work. This is also relevant to my research because my works are also use found objects that are used by other people to political and social issues. The painting, Constitution III, was one of the four paintings in his Constitution series. 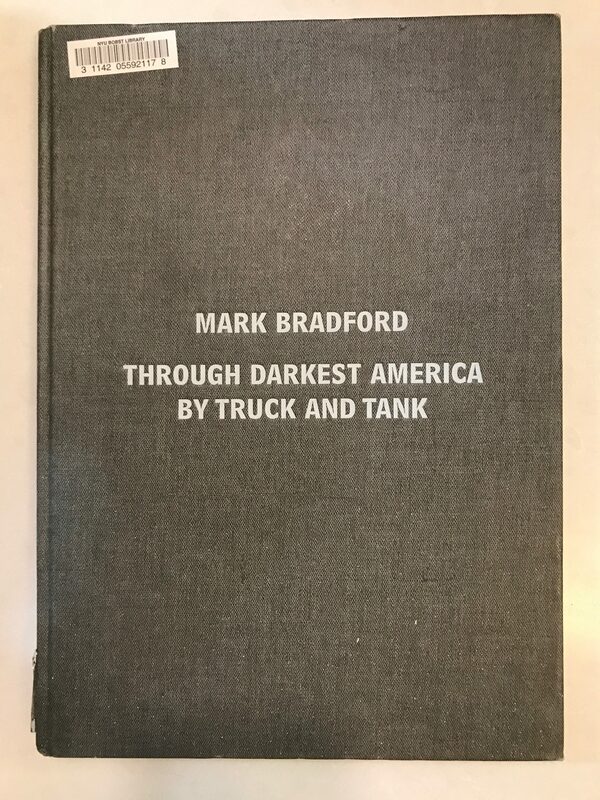 The Constitution series was part of ‘Through Darkest America by Truck and Tank’ exhibition at White Cube gallery. The exhibition consists of Bradford’s recent paintings from 2010 to 2013. The title of the exhibition came from a chapter in the memoir of Dwight D Eisenhower. Eisenhower was impressed by Germany’s infrastructure and he helped pass the Federal Aid Highway Act in 1956 to build freeways in the United States. And Bradford states that freeways have more immediate relationship to poor people because freeways always cut through poor neighborhoods. Therefore, freeways are class marker which divides the neighborhood by class. Bradford uses nylon string to trace the letters of the texts and then he applies paper to the surface. Then, he pulls out the strings to create the negative space of the texts. His paintings are abstract, but they also resemble walls and maps. The fissures he makes with strings resemble the topography of maps and they also look like they are made by the nature such as earthquakes. 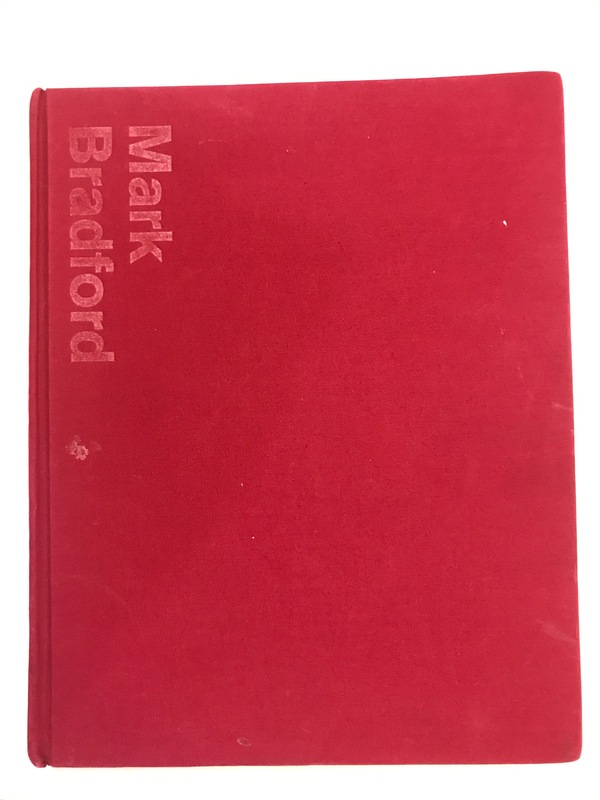 Bradford used to collect billboard scraps, fly posters, and street maps for his previous paintings, but in this exhibition, Bradford also used paper that he printed because those materials are becoming obsolescent these days. And the printed materials are from the memories of a place. While his previous paintings were specific to certain locations, Constitution III does not have specific location that he is referencing to. 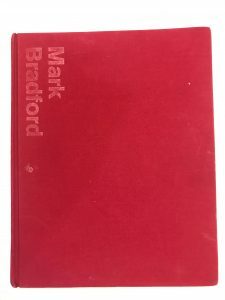 Bradford uses high saturated colors first and then he adds bleach to the paper so that it creates the effect of natural bleaching of the exterior of a house paint. While I was observing how people interact with the artwork, there were usually two to three people who stopped to look at this piece. I think this painting was the least popular work in the exhibition. Most of the people who stopped at this piece spent less than ten seconds to look at this painting. 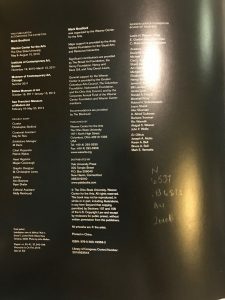 Most of the people who came to The Usable Past section of the exhibition were only looking at the video work that was next to Bradford’s painting and they just skimmed over the other works in the section. I think the first reason why people did not pay much attention to this work is because the painting is so abstract. There were no explanatory text for this painting and the only information that the text for The Usable Past provided was that the text in the painting was from an excerpt in the U.S. constitution. This work was hard to understand and appreciate especially for the general public because it is abstract and the visual of the painting does not directly relates to social issues unlike other works that have clear visual connections to social issues such as racism and AIDS. Another reason that people did not pay much attention to this work is because it was right next to video artwork. 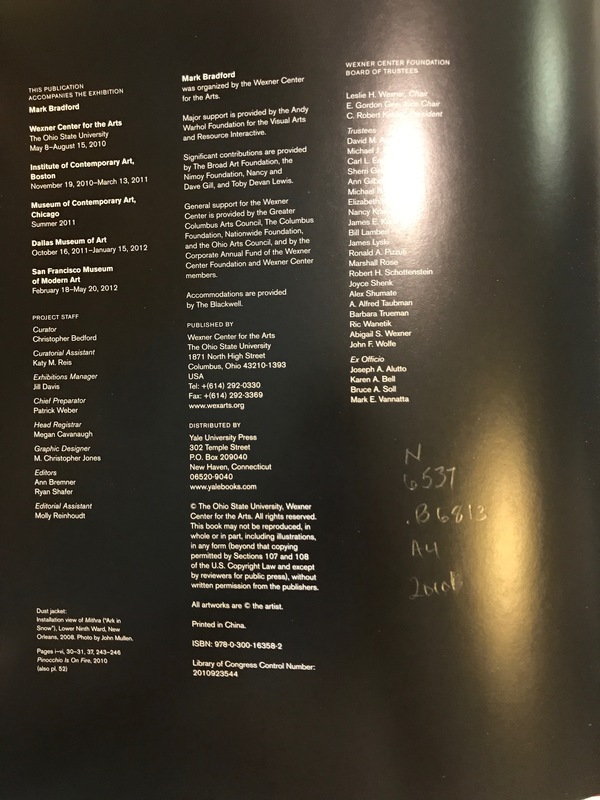 The video work had very strong visual elements and sounds that capture the audience’s attention immediately after they enter the room whereas the other works in the room were two dimensional and relatively simple in visual compared to the video. Most of the viewers who walked into the room looked at the video first. Since the video really captures the attention, most of the people were gathered in front of the video. And because there are a lot of people in front of the video, other people who came after them naturally paid more attention to the video than other works. One thing that I realized while I was observing the viewers was that they move back and forth to read the text. This was interesting because people usually stand still when they look at paintings, but this painting forces the viewers to move because of its scale. I thought this thoroughly calculated use of scale in this painting was truly admirable and inspirational as well. While I was conducting an interview about the viewer’s experience of the artwork, the most challenging part of the interview was to find someone to interview because a very small number of people actually spent enough time and paid enough attention to have an opinion about this piece. Even when I found someone who seemed really captivated by the work, most of them refused to have an interview because they wanted to see other works. Another thing that was challenging was that the viewers actually do not have much thoughts about this piece. 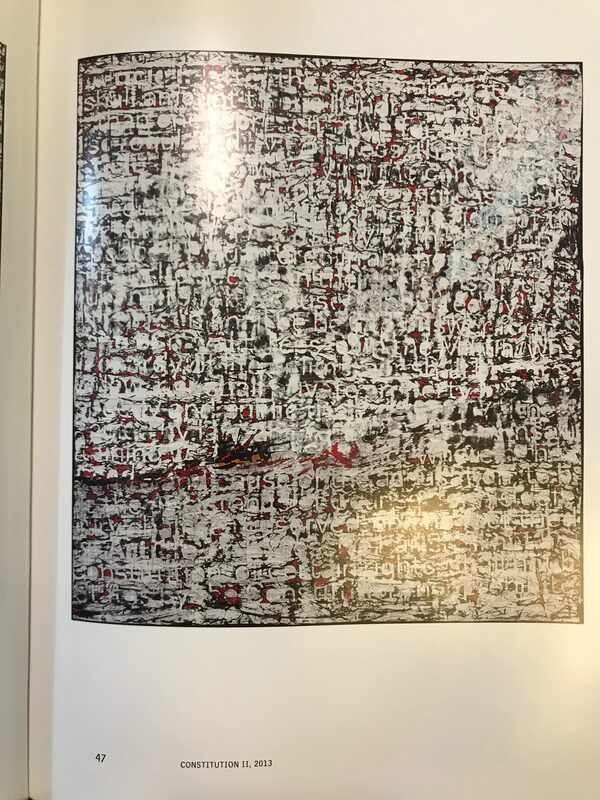 I think this is because the painting did not have any explanation except the fact that it is an excerpt from the U.S. constitution and the artwork is very abstract. 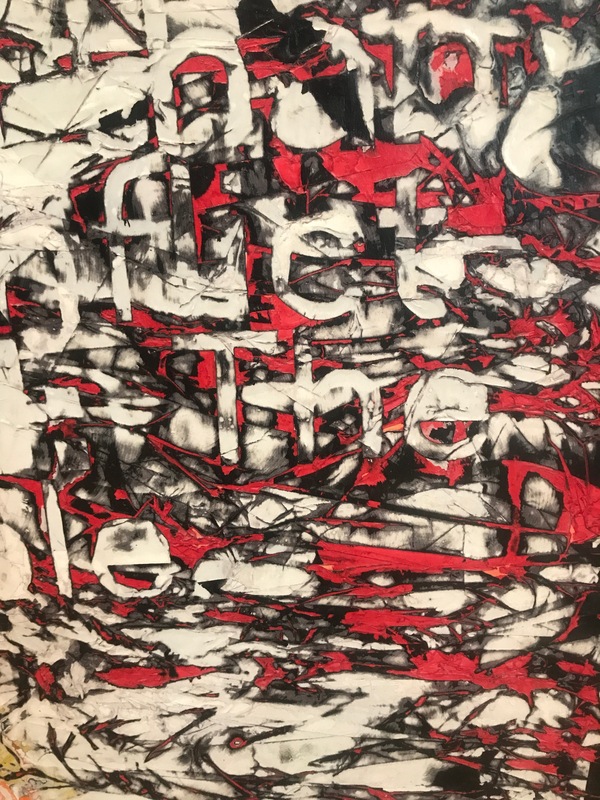 I asked the viewer how they interpret the work, what the painting remind them of, and how the fact that the text is an excerpt from the U.S. constitution changes their views towards the work. Even when I found someone to interview, the answer was very vague and difficult to understand the answer. 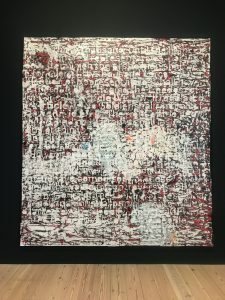 I think the question about how they interpret the work was a mistake because since the painting is very abstract and esoteric, it was too challenging for the general public and even people who studied art to provide an interpretation of the work just by looking at the work for few minutes. The benefit of doing this kind of research was that I could understand how the general public actually think about the artworks and how they react to them. This was very helpful because the reactions that the artist intended to provoke or the reactions that are written by experts in books do not always apply to everyone. I think this is very important in art because art is a visual language and knowing how people actually react to the work can be a way to assess how successful the artist communicated with the viewers. Q1. How do you interpret this work? It is difficult to explain. Q2. Does it remind you of anything else? It just looks like mixture of English words and pictures. Q3. How does the fact that the text is an excerpt from the U.S. constitution change your view towards the artwork? I think it symbolizes acceptance and it is clearly interesting.